Philosophy of Care: Open communication with patient and family. Looking at the patient as an individual. Dr. Gordon received her medical degree from Columbia University, College of Physicians and Surgeons in New York City. She completed her medical residency at Beth Israel Hospital-Harvard University in Boston. Dr. Gordon did her Gastroenterology fellowship at the University of Chicago Hospitals, where she received special training in the areas of nutrition, hepatology and inflammatory bowel disease. After completing her training, Dr. Gordon spent four years practicing gastroenterology in the Northern Chicago Suburbs. 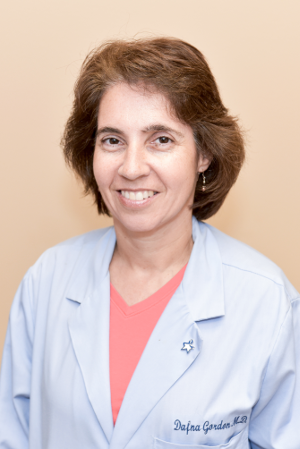 She joined Gastroenterology & Internal Medicine Spec, S.C. in 1999 in Barrington where her special interests include gastroenterological problems directed to the needs of women. Dr. Gordon is married and the mother of two boys. Her husband is a dermatologist and researcher at Northwestern University. Dr. Gordon and her husband enjoy being involved in their children’s activities, such as band concerts and sporting events. Dr. Gordon also enjoys reading contemporary fiction and mystery novels. Dr. Gordon believes in keeping her patients well-informed and in having them take an active roll in their medical care. She feels that attention to personal needs and open communication are essential to giving patients quality medical care.